Yesterday I showed the process leading up to the cover of Everything Goes: On Land. Without further ado or brouhaha, here’s the final cover of the book. Click the image to see it quite a bit larger. The cover design had to be indicative of the work that’s in the book, and I do believe it is. Cars and trucks, bikes and motorcycles, buses, construction vehicles, trains, and whatever else made it in the book and on this cover. Vehicles going this way and that way, all kinds of people riding and driving them, and even a friend’s blue and white striped Mini Cooper. Once the final sketch was approved, I use that as the basis to create the inked drawing. I usually try to create my illustrations to the exact size that they’ll be printed. Everything Goes is going to be a big book — twelve inches tall and ten inches wide — so this was no problem. I draw the illustration using a big lightbox on nice Strathmore 500 series bristol with watered-down india ink, and use white gouache to carve out areas and add details. If you take a look at the close-up image below, the wheels of the train, the white outlines of the train windows, the railroad ties, and the wing of the small black bird are examples of where I paint the negative space, or the white areas. When I inked the drawing, the area under the train was solid black. This part of the process is easily my favorite, as it’s a real joy to see these details appear and everything come together. You may also notice that there is no type on the black-and-white line drawing. This is because when I do work like this I always draw the type and add it digitally. Once these are all complete, they get scanned into the computer where I use Photoshop to color everything and piece it together. When it’s complete, I save it as a TIF file and send it to the designer at the publishing house (Balzer+Bray/HarperCollins in the case of Everything Goes). Everything Goes: On Land is scheduled to be released on September 13. I’m currently working on book two of the series, which is called “In the Air,” and which will be published a year later. Lastly, “On the Sea” will come out in 2013. I don’t have the covers sketched for either of these two books yet, but they will be similar in idea and business to “On Land.” And of course I’ll post here about them when they’re ready to make their way into the world. Stay tuned! If you’ve ever looked at anything I’ve made, you likely noticed that I like to hand-letter things. I used to be a type geek back when I was a graphic designer, but at some point — mainly when I started illustrating — I quit using actual fonts with any regularity and started drawing type on everything. This is sort of within the great plan of life or whatever, as it was a calligraphy kit my mom bought when I was 14 years old that led to my interest in type and design in the first place. Over the years I’ve considered many times designing a font. However, it never really made sense, since the type I draw is usually improvised and created for the specific place in which it sits, and I like the look of each letterform being different. That is, if I have two lower-case ‘g’ next to each other (which happens frequently. Re: “Biggs”), I usually like them to look slightly different from one another. It’s part of the illusion I struggle with to keep my work looking as least digital as possible. So I’ve never really found the right project for which to create a typeface. However, in setting up the workflow of this huge three-book project I’m writing and illustrating for HarperCollins, I’m realizing that every page is going to have anywhere between ten and a hundred captions and labels. And the prospect of lettering each and every one of these (“convertible,” “tow-truck,” “taxi,” “subway,” etc) makes my kind of want to go on an extended vacation. And it makes my hand hurt. So last week I realized that this is it. This is the time to make a font. After googling a bit looking for an appropriate application, I located one called TypeTool. Back in the day when I was working at Adobe and stuff, everyone used Fontographer to make typefaces, which I thought had died. Apparently, Fontographer has been rejuvenated and is also published by Fontlab, but it’s about a million bucks. Since I have no current plans to make other fonts (but never say never, right? ), TypeTool will do the trick and it’s a lot less expensive. So… I set about painting/drawing a set of letterforms, which I then scanned at really really high resolution (1200 ppi) and cleaned up in Photoshop. I used Illustrator to trace the letterforms into vector shapes, which I could then copy/paste into TypeTool. I haven’t had time to read the manual for TypeTool yet, but I remember the basic idea from back in the Fontographer days. Not everything is perfect yet. There are some weird pairs and a lot of the punctuation and quotation marks aren’t really perfect yet. Furthermore, I didn’t include many of the more esoteric glyphs like the signs for foreign currency and stuff like ∆Ωª. I suppose if Everything Goes is translated into other languages, or if by some weird turn I need the Greek alphabet in my captions and stuff, I’ll add them later. I used to use rubber stamps all the time. There was a terrific little shop near where I worked near San Francisco that did custom stamps. So I’d hand-letter my address and use it for envelopes and business cards. However since living in Philadelphia (for more than ten years) I’ve never got around to it. I recently moved into a studio where I hope and plan to work for a long time. In addition, I need to send stuff out more than I once did (posters and things), so I finally got some new stamps made. I use these for lots of stuff. I can stamp cards, the backs of promo materials, your upper arm, any kind of correspondence, and so on. Now here’s the kicker. This place I found fairly randomly, Simonstamps, got this order from me on Tuesday. Two days ago. They produced and shipped it yesterday, and I just received it. Two days! And the most expensive stamp here was $12. All together the order for these nine stamps was around $70. Need I say I recommend Simonstamps? This is the cover illustration that goes with the robot and the stegosaurus on the previous post. Kid’s Guide is a publication in the L.A. area for parents. The article here is about getting kids organized. The solution was in my head from the start and went right through without a hitch. Fun project. The banners for the Philadelphia Book Festival are up around Center City Philadelphia. Designed by Kelly Beh, they use a part of the poster illustration and really stand out in today’s bright sunlight. These were taken on Market at 8th, Arch at 16th, and in front of the library. They are also on Broad at Spruce and Walnut at 19th. The festival is May 17 & 18 so if you’re around, come by the library and say hi. I finished this illustration last week for the Free Library of Philadelphia’s Book Festival coming up in May. It will be posted all over and they’re running ads in the papers and hanging banners on Market Street. 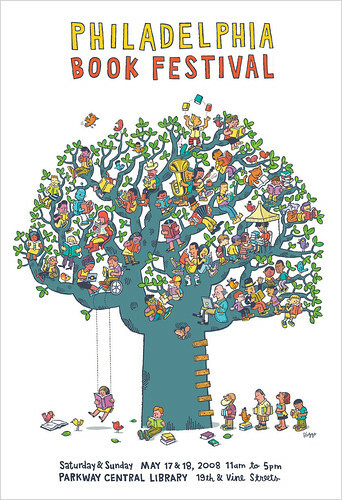 Look close and find all the various odd book-lovers. I’d love to have used actual literary characters but I probably could not have cleared copyrights, and it would have added weeks to the amount of time I’d need. I’ve got details of the poster uploaded on Flickr as well. Willie Nelson played The Fillmore in San Francisco for five shows last week and I was pleased to be asked to make one of the posters. I was asked to somehow include a guitar in the design, so I did that. The final was printed 4-color at 12×19 inches. If you happened to see the show, let us know how was it? I’ve never seen Willie Nelson play, but gee I’d like to. This is a three-color poster I designed this week for Ladytron at The Fillmore in San Francisco. It’s being printed today (13 Oct). The project started out as a robot, but that got shot down. In the end this is not a bad thing, as I plan to use the robots for other things anyway. 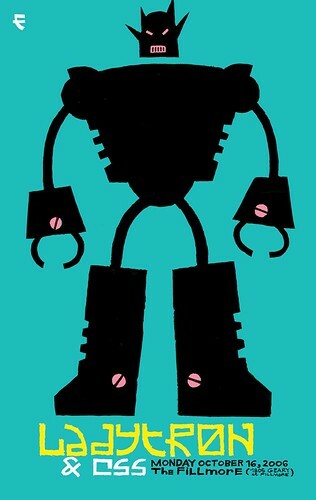 Additionally, while I love the robots more than this particular image, I think this is more appropriate for the band.